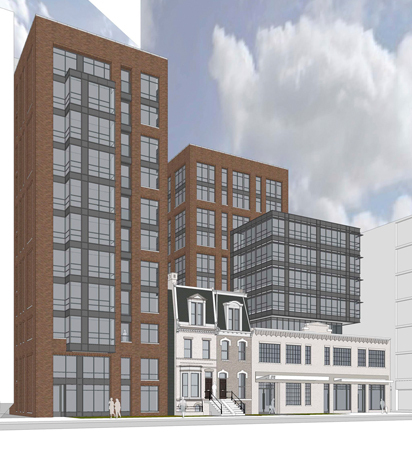 Equity Residential's mixed-use redevelopment encompassing several historic properties at 443-459 Eye Street NW is set to begin construction this summer. "We're looking at an August groundbreaking," said Greg White, Vice President of Development at Chicago-based megadeveloper Equity Residential. "We're working with Clark Construction, and finalizing construction documents now. We hope to deliver first units in a little less than two years; the summer of 2014." Once touted by former owner Walnut Street Development as Eye Street Lofts, Equity Residential purchased the property for $5.1 million in April of last year and, with HPRB approval for the plans secured since 2006, advanced the project swiftly. The design, by Hickock Cole Architects, preserves the two 1880s-era historic rowhouses on the lots (as mandated by law), and incorporates the also-historically-designated industrial buildings, while erecting two additional residential towers directly adjacent. When complete, it will offer 165,000 square feet of residential space and just over 2000 square feet of ground floor retail. "It was originally conceived as 162 units, but the plans have been increased to 174 units," White said. "Architecturally, it's a little old, a little new; you have the historic rowhouses, and then a different type of high-rise on top, and a new one to the side. We're blending it all together to make it work." The site was formerly the home of Gold Leaf Studios, an artists' space, and an auto body shop housed in a former blacksmith's shop. Another building on the parcels, which was leased by BicycleSPACE, is marked for demolition. Hideous. It looks a housing project from the 1980s. Thanks for replacing one type of blight with another, more permanent, one. Awful, awful, awful... As anon above mentioned, it looks like "poor people towers" circa 1981. The scale of the tower on the left is a big eff-you to the human-scaled old buildings. Blargh. Truly hideous... they should know better than to put up this dud. Does this have to go before the HPRB? I am glad to see this project get off the ground. I am little surprised at the intensity of objection. Don’t know what people want or expect here? This area is an emerging home of functional apartment buildings in a previously rundown area full of empty lots. It is never going to have the Old World Charm of Paris or even Dupont Circle. This will take another step toward knitting the Mt. Vernon Triangle area into a real neighborhood, and less of a collection of random apartment buildings in a sea of empty lots. "People" are objecting to lack of design quality. Don't confuse that with objecting to constructing a building, or even the overall scale of the project. "People" want well-designed architecture that also integrates with the neighborhood and its neighbors. It can be modern (see Ventana condos on F St NW), and still be a good neighbor to historical architecture. This design is an example of how not to build next to older smaller-scale structures, in addition to being simply ugly on its own merits. Total agreement on the design aesthetic. What happened to the basic principals of top, middle and bottom. It has all the charm of a structure I would have made out of Lego as a child. Definitely, retro 80s. Screams of cost saving design choices. I went to the DC Thug website commentary section and commented about the lack of architectural quality of this proposed building. All they wanted to talk about was prostitutes. Cmon, this is a real estate centered website. The fact that we care about design doesn't mean that we are blind or uncaring to the conditions of the neighborhood. But there is a strong interest in design in this community and this website is an outlet to comment on design. "What happened to the basic principals of top, middle and bottom." That is a lost concept amongst the post-modern architectural crowd. Buildings with discernible bases, middles, and tops are more pleasing to the human eye. No amount of glass and steel or visual tricks is going to change that. There are better ways to integrate new construction with historic buildings. The Ventana at 9th and F Streets, NW is a good example of how to do this. Somehow when this site changed hands and a new architect was brought on after a decent site plan was already complete and ok'd by the HPRB, this architect turned an ok plan into a bad one with a couple of strokes. There is no discernible base, middle, or top to this building. The uneven heights of the various tops of the buildings seem jarring as well. Even the color of facade is ugly. I think the HPRB failed the community by letting this pass. For instance, one cannot easily tell where the entrance to the residential building is. The architect's presentation of the window bays is a bit crude and unsettling to the eye. They are just kinda sitting out there with no redeeming quality or differentiation from the rest of the building. Oh, and the top of the building (which I must mention again) is the hallmark of most of these post-modern edifices. It just ends quite ungraciously and abruptly. kudos to Adam L for distinguishing yourself from the anonymous commentators. Really folks, what's so hard about creating a unique name for your comment? Anyway, I kind of like the crude sketch-up picture. First, because it does have staggered heights and doesn't just try to fill the zoning envelope with a DC box. Second, because the brick and window grid of the two towers gives off kind of an industrial aesthetic that plays off of the old garage. I think better to refer to that than try to scale up the townhouses, or defer to the brick and precast context of the new buildings along Mass Av. Finally, the glass box above the old garage provides a break from using the same scheme for all facades, though I'm not sure it's the final solution. This is why we need to go back to the aesthetics of pre-WWII architecture. Clearly, this architect doesn't have the skills, but with a traditional composition it would have been a passable background building. With the modern aesthetic (w/o decoration) it looks like a slab adding nothing to the street but banality. I'm not a trained professional but that proposed building does look hideous. As others have said it does resembles a housing project in NY or London. But architecture in this city is a joke so I don't expect much. Ahem. Well, let's pull some things apart here. First, it's not a very good rendering -- the building will probably look better than this drawing. Second, it looks like a VERY awkward site. Those two row houses with mansard roofs really throw a wrench in the works. Almost anything is going to clash with them. Having said that, I do think the main body of the new building is disappointingly bland and stodgy. Actually, a much glassier tower at the street line would have been more successful (the section that appears to be partially cantilevered over the building to the right is much more attractive than the boring, brick part). I think this is what people are getting at when they cite the Ventana, which I also think is a really good project. Some of the previous comments reveal some serious confusion about architectural history, not to mention biases about architectural expression. There are plenty of beautiful modern buildings, for instance, that don't have a distinct base, middle and top (and there are some that do). More to the point, it was certainly not the post-modernists who wanted to do away with distinct bases, middles, and tops -- if anything, they argued for a return to such motifs. The massing of the current scheme appears to be essentially the same, but the articulation of the facades has lost all elegance. Basically, this appears to be a clunky, much-cheaper version of the original. I suspect that even the Tea Party armchair architectural critics (who apparently use DCMUD as therapy) would find something complimentary to say about the original scheme. Ultimately this will be a mid-block bulding and as such not particularly visible. But that's no more than mild solace. The 2012 version should learn from and build on the 2008 version--and therefore be BETTER. Especially since values in Mount Vernon triangle aren't that different now than they were during the boom: that excuse doesn't fly in this case. "Some of the previous comments reveal some serious confusion about architectural history, not to mention biases about architectural expression." Why don't you educate us about a history that you refuse to learn from! God knows how smart I would sound if I aped your biases. "I suspect that even the Tea Party armchair architectural critics "
How dare the public be engaged enough with their surroundings to ask for something better. Didn't they read the modernist manifestos that dictate to them what to like? What John H said - it would be nice if these anonymous commenters would at least invent a commenting handle. It's impossible to differentiate one anonymous blah blah blah from the next.